Architecture can be compared to a musical score composed of relationships, concatenations, punctuation and proportions of full and empty zones, solids and transparencies, materials and chromatic scales, although its registers – especially when they come to grips with spaces and times inherited from the age-old history of a place – require sensitive interpretation to produce a symphony. Working in a family tradition, Alberto Torsello – the Venetian architect behind the recent rebirth of the Scuola della Misericordia designed by Jacopo Sansovino – has practiced restoration from the outset of his career, working over the years with Tobia Scarpa, Gae Aulenti and Guido Canali, among others, on projects of great public impact, not only in Venice. The habit of listening to what already exists with rigor and measure has also been the key with which he approaches the theme of the private residence, associated in this case with the recovery, structural renewal and repurposing of a historic architectural organism with a high profile in the Dorsoduro zone. 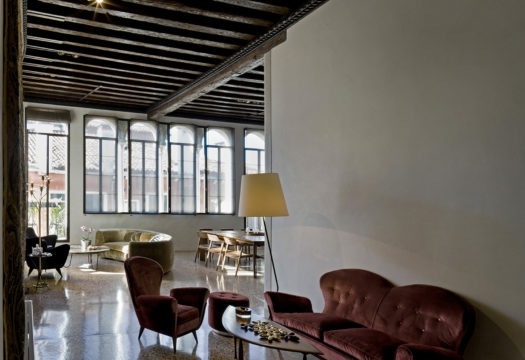 “This residence with an area of 350 square meters and a long balcony running through the main spaces,” Torsello explains, “comes from the combination of two adjacent units, one late Gothic and one Renaissance, with particular characteristics. While respecting the architectural volumes of the past, the contemporary life of a family with many children and friends required many spaces, for the art of entertaining and hospitality. 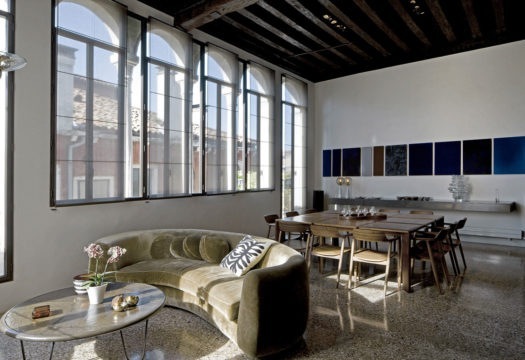 In substance, a very large living area (which conserves the L-shaped plan of the Venetian Renaissance), many bedrooms and bathrooms. From a design viewpoint, this forced me to find compromise solutions. For example, the kitchen – though it is very fully equipped – remains in a small service space, not involved in the social contact of the rest of the house. In the interpretation of the Fundamentals suggested by Koolhaas, Torsello has conducted an almost philological operation: having restored the beautiful Venetian terrazzo floors and reinforced the wooden ceiling beams belonging to two different historical moments, he has updated an original material, bringing out its aesthetic and tactile values. In the living room, for example, there were a four-light window and two single windows at its sides, from the Renaissance, which would have been compromised by bulky frames. The solution was to insert a slim frame in burnished brass, which revives the beauty of the historic windows; the frames are produced by Secco Sistemi based on Torsello’s design (the versatile OS2 75 system, winner of the Compasso d’Oro award in 2018). The windows of the bedrooms, located in the late Gothic part of the building, are in another key, where the wood of the frame becomes a programmatic decorative feature. The doors have also been developed with a series of variations, with different meanings depending on the order and ranking of the spaces. That of the kitchen, a white, flush-mounted unit, is a sort of floor-to-ceiling cut that spatially and visually connects two places. To the contrary, the passage opened in the wall to connect the two buildings is a powerful gap underscored by sheet metal and the presence of a marble staircase that accompanies the game of levels of the floor surfaces. The doors of the bedrooms, in cherry on an iron frame, introduce other relationships of weight in the overall setting. In the bedroom zone for the children, the architect has experimented with a double threshold, where the rooms face off across a shared central space leading to the bathroom, enclosed in a curved volume to interrupt the linear arrangement of the architecture, for a more fluid sense of communication. The designer applies sinuous geometric lines to also bring dynamism to the new staircase leading to the attic, made in wood with fibers parallel to the railing: a sculptural, monolithic object created thanks to the mastery of local artisans. Every presence has been gauged down to the millimeter. The newly built walls utilize wooden panels that conserve the impression of the original spaces, while a unified pale, neutral finish in marmorino, “a material that is an excellent memory catcher,” the designer says, “will allow all the spaces to gain warmth over time. In a historic container of this type, there was a need to tone things down a bit. The contaminations have to be controlled, never cannibalizing each other.” So the fixed furnishings are also very discreet, entering the domestic stage almost on tiptoe, while the furniture – mostly pieces from the 1950s and 1960s – has been carefully selected for high design and production quality, in balanced juxtapositions that also take the contemporary artworks in the rooms into account. 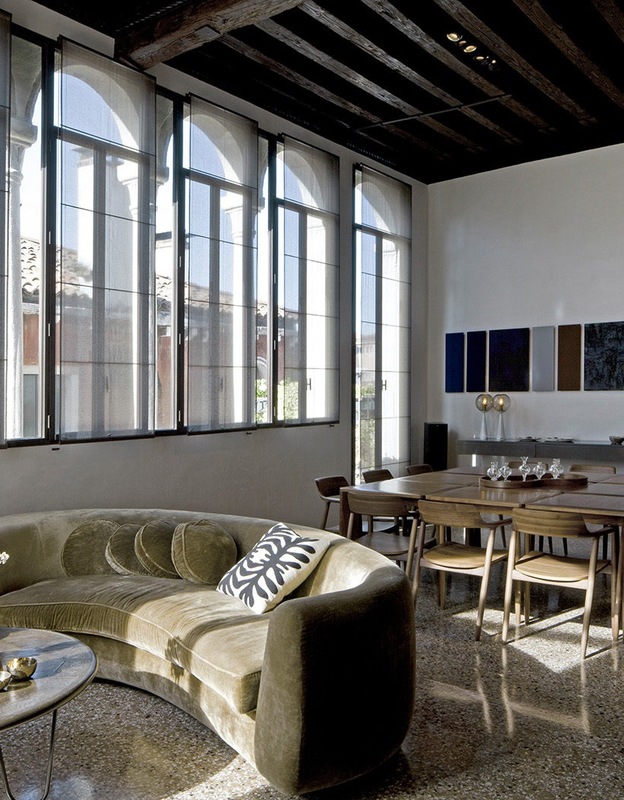 The living area dominated by the large window typical of the Venetian Renaissance, featuring an OS2 75 burnished brass frame produced by Secco Sistemi based on a design by Alberto Torsello (Compasso d’Oro award 2018). The walls are finished in marmorino; the rounded corner in Istria stone enhances the L-shaped spatial construction like a pivot. In the living area, the red upholstered furnishings are pieces from the 1950s designed by Paolo Buffa, while the floor lamps are original models from the 1960s. An opening leads to the marble staircase and to a living-studio zone in the late Gothic portion of the house. The space is enhanced by a collection of chairs designed in the 1950s and 1960s, selected by the client. The dining area with the Hiroshima chairs and wooden table by Naoto Fukasawa for Maruni. 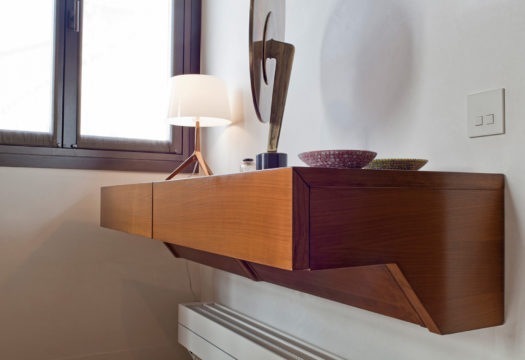 Under the long storage shelf designed by Alberto Torsello, a radiator by Runtal. 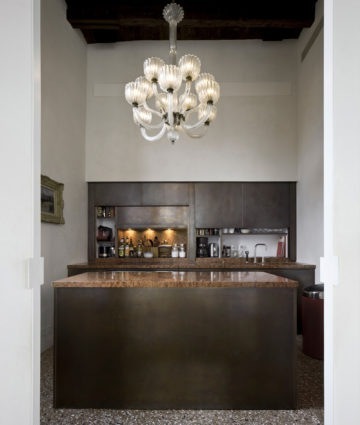 The kitchen with a central island in burnished brass with a worktop in Rosso Verona marble. A Murano glass chandelier from the 1940s attributed to Barovier & Toso. Note the device of the double vertically sliding accessorized partition. The children’s bedroom zone with the shared central bathroom enclosed in a curved volume that interrupts the linear arrangement of the architecture. In a bedroom, detail of a custom cabinet made in cherry wood. 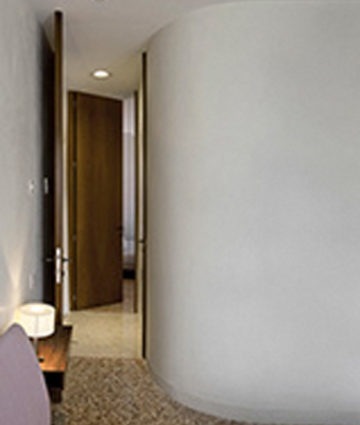 The Lithoss switchplate is in a custom color to blend with the tone of the wall finished in marmorino. 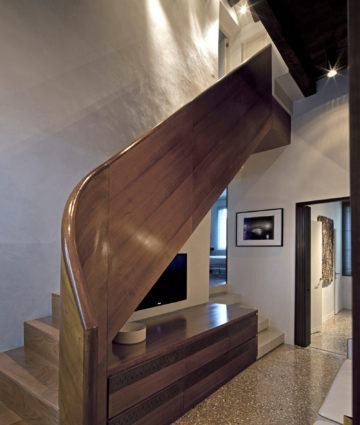 The sinuous, dynamic staircase leading to the attic, designed by Torsello and made in cherry wood by local artisans. The master suite with a wooden table that suggests the design of Angelo Mangiarotti and a bed produced in Italy. 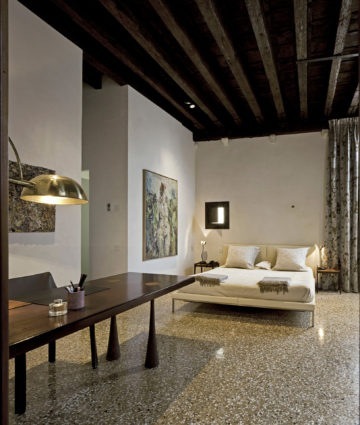 The terrazzo floors and wooden ceiling beams have been carefully restored.